A few weeks ago I put together Part I of my guide on how to set up Bitstreaming with your Windows 7 HTPC . Part I focused on using Media Player Classic, so Part II will focus on setting up bitstreaming using WMP12/W7MC. This gets a little tricky, so you will see why after reading this guide my recommendation is just to use MPC-HC if possible. Much of the issue at hand revolves around Windows Media Foundation, which does not support VC-1, DTS or HD Audio. An example of this would be if you have a VC-1 m2ts movie with TrueHD audio track and try to play back in WMP12 or WMC you will see no video or hear any audio. So unfortunately this means we need to hack around a little to get “proper” playback. Much of this guide is based on AVSForum member renethx’s excellent post which can be found here. I decided to take a look at two different approaches. The first approach is the DIY approach which involves installing all the codecs/filters yourself (this is actually the approach I have been following successfully for over 4 months). 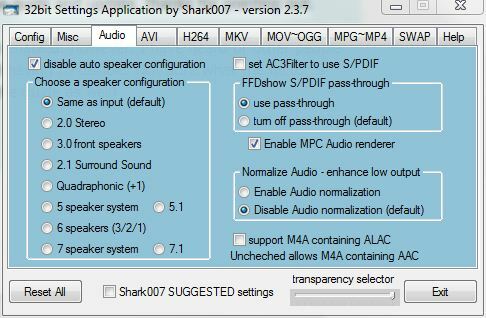 The second approach will be using Shark007′s codec pack(I don’t usually recommend codec packs but Shark’s is the only one I would recommend). As you will clearly see in the disclaimer below, once you start hacking around with codecs/filters there is a chance that you mess something up with your system, so proceed with caution. For every person that gets this to work I hear about another person who cannot, so it is far from a perfect solution and I cannot guarantee it will work as the ability to bitstream with ffdshow is still relatively new. I have actually been noticing some inconsistencies with the results on my HTPCs of late, where one file will play perfectly with bitstreaming yet another with the same exact information will not play. As of now I prefer to just stick with MPC HC. I do plan on building another HTPC (mini-itx) in the coming weeks which I will use for further testing. NOTE – You can follow this guide even if you don’t want or can’t bitstream, as this will still enable you to play back m2ts VC-1 in WMP12/W7MC (this is how I have been able to do so with my HTPCs prior to getting the 5670 GPU). DISCLAIMER – Already mentioned once, but can’t emphasize enough, it is highly recommended that you have a backup/restore point or image of your O/S that you can revert to in the instance that something doesn’t work. Also, the steps listed here require disabling Windows Media Foundation which may cause undesirable effects to your setup, and possibly your love life. When I first set up my PC I make a backup immediately with Windows Home Server (I call the backup something like “W7 Clean”) and lock the backup so it does not get deleted. I have used Windows Home Server quite a few times to restore to this backup and it has worked like a charm. Refer to Part I of the guide. The steps below were done on my Windows 7 x32 HTPCs. I did test as well on my wife’s Windows 7 x64 PC and the steps did work. However, her PC is not connected to a receiver so I did not confirm that bitstreaming was working. Make sure that you grab the correct files (x32 vs x64). 6. If you decide to use Haali, install now. You can keep all the default settings if you would like, however I unchecked the “disable internal splitter” options. If you are not using Haali skip this step. 8. Extract MPC HC Standalone Filters. We are only going to need a few of the available filters. I created a folder called “MPC Filters” where I place the filters I need (i.e. C:\Users\Damian\AppData\Roaming\MPC Filters), and then for each filter created a separate folder. Depending on your setup you may or may not need all of the filters listed below. Download and register MatroskaSplitter.ax (this is only necessary if you are not using Haali and want to play back mkvs). I created a folder called “MatroskaSplitter” in my MPC Filters folder, and downloaded MatroskaSplitter.ax into it. An easy way to register this filter is to create simple bat file. To register, open up notepad and type the below. Save file as install.bat in the same directory as where the MatroskaSplitter.ax filter is stored. Double click on the bat file to register. Download and register MPC – MPEG Source (Gabest) – MpegSplitter.ax (this is only necessary if you have ts/m2ts files to play back). I created a folder called “MpegSplitter” in my MPC Filters folder, and downloaded MpegSplitter.ax into it. An easy way to register this filter is to create simple bat file. To register, open up notepad and type the below. Save file as install.bat in the same directory as where the MpegSplitterSplitter.ax filter is stored. Double click on the bat file to register. Download and register MPCVideoDec.ax. This is completely optional. The default WMVideo Decoder DMO that is used for VC-1 does not support DXVA, so use this if you want DXVA for your VC-1 movies. I created a folder called “MPCVideoDec” in my MPC Filters folder, and downloaded MPCVideoDec.ax into it. An easy way to register this filter is to create simple bat file. To register, open up notepad and type the below. Save file as install.bat in the same directory as where the MPCVideoDec.ax filter is stored. Double click on the bat file to register. 9. Now this may sound a little confusing so bear with me. If you are playing back m2ts files and have installed haali, during playback WMP/WMC may find the haali splitter and use for m2ts files. So aside from registering Gabest we also need to replace the registry key in HKEY_CLASSES_ROOT\Media Type\Extensions\.m2ts to ensure that Gabest is used. To do so copy the below to notepad, save as “m2ts_Gabest.reg” and double click the saved file (I just threw the .reg file in the same folder as where I saved MpegSplitter.ax). Nothing needs to be done on the next screen. On the last screen check “Disable Microsoft DTV-DVD Audio Decoder” and “Disable Media Foundation”. 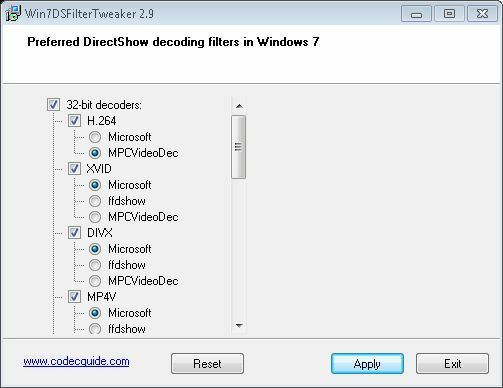 What Win7DSFilterTweaker does is rename the dll files (msmpeg2adec.dll and mfds.dll respectively located in C:\Windows\System32). You can also do this step manually, which requires taking ownership of the dlls (see Helpful Tips section for how to take ownership). 11. Not really a step, but if you even need to unregister a filter I find the easiest way to do is to use RadLight Filter Manager. Simply run the application, go to DirectShow Filters, locate the filter you want to register, and click the “Unregister” button. 7. Install Shark’s Codec Pack. (b) Under the “Misc” tab check “DO NOT use Haali (global setting). Once again, this is only if you do not want Haali used. (c) Under the “H264″ tab select “Use MPC-HC codec” for both MPC-HC DXVA codec and H264 codec in DirectShow Players. For the latter you can also choose “Use FFDShow DXVA codec” but since this is relatively new I stick with MPC-HC. 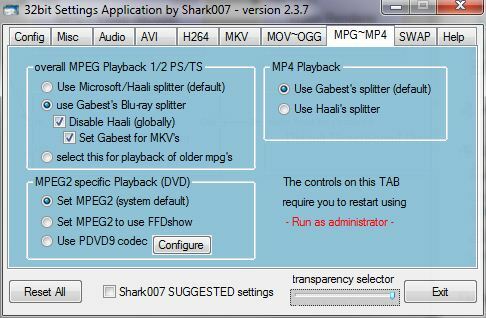 (e) Under the “MPG~MP4″ tab select “use Gabest’s Blu-ray splitter”. This is only necessary if you have m2ts files. 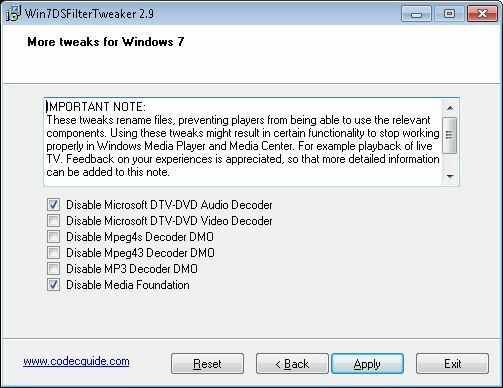 (f) Under the “SWAP” tab check off “Use MPC-HC for WVC1 instead of Microsoft”, “Disable Microsoft’s Audio Decoder” and “Disable Windows Media Foundation”. 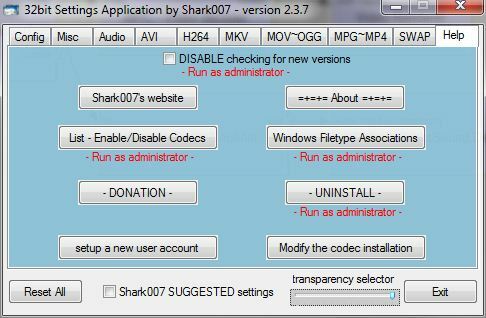 (g) If you decide you want to uninstall Sharks’ codec pack, simply go to the “Help” tab and click “Uninstall”. All settings will be reverted back to before Shark was installed. - Make sure you have UAC disabled while going through the steps, UAC appears to cause problems with registering the filters. Highlight “Administrators” under “Change owner to:” and click Apply. Keep hitting OK until you are back at the Security tab. Highlight “Administrators” and tick under Allow the box for Full control. - As I mentioned earlier, it has been hit or miss to get bitstreaming HD Audio from WMP12/WMC working correctly. 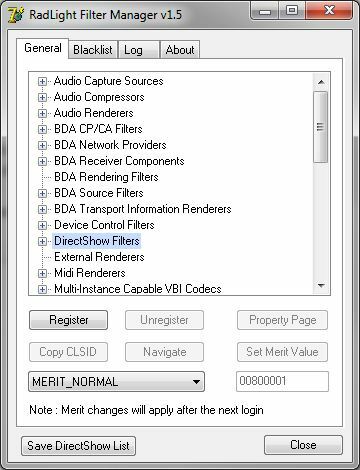 One way to troubleshoot if a file does not play back, go into the ffdshow audio decoder configuration, go to output, and try unchecking some of the audio outputs in the Pass-through section. Sometimes unchecking and then rechecking works, sometimes a movie only works if all are unchecked, very strange. - Some people have reported that videos will not play when “Play sounds when navigating Windows Media Center” is enabled. To disable, start WMC, go to Settings -> General -> Visual and Sound Effects and uncheck this option. Great job and thank you for posting. I am a bit disappointed there aren’t x64 instructions; seems to me this is the future, again though thanks for the post. I am not sure what x64 instructions you want to see. I even mention in the guide that for the DIY setup x64 is the same as x32, you just need to grab the x64 filters (I tested this on my wife’s x64 PC). As for Sharks you would just need to download the additional x64 pack he provides. Let me know if you think I am missing something. There’s just been some things not 100% clear about the x64 part of this equation. Like the difference between registering filters/codecs in the syswow64 vs system32 directories respectively. Again, taking nothing away from your guide. Prior to this article I cobbled together instructions from avs and do in fact have bitstream working on my clarkdale based win7 x64 htpc. One thing that would also be interesting to know is if you do in fact use Shark007 can you independently update the codecs/filters in the install directorie(s) ? Seems to me you could and still use the Shark manager thingy to control all of them. Only reason I ask is while shark does get the codecs updated rather quickly, ffdshow changes almost daily now. I had actually asked Shark about updates and I believe there is a way from his tool to update a particular (such as ffdshow). I never tested out though. Roger: Details on your setup? Are you bitstreaming audio via 7MC ? What components do you have? Joseph, I am not bistreaming audio. I just have a htpc feeding my hdtv. I was just trying to point out that I have not had any problems with Sharks codec pack. I also use it on my laptop running x64 Vista without any issues. Just received my mini-itx case. Should be getting my mini-itx mobo, so I can start building my core i5 HTPC. I will load it with x64 and report back. First, what about the Audio tab in Shark? Should the “Use pass-through (Digital Audio)” be checked? Along with the speaker configuration? It worked both ways, but with the pass-through checked, my receiver appeared to be doing the decoding (so I am assuming I should). I didn’t even look at the audio tab, but essentially clicking the passthrough would have the same effect as checking off manually in the FFDShow Audio config as I show. I will mention this in the guide and update, thanks for pointing out. It’s been a while, but apparently my issue with disabling Media Center Sounds to prevent the Video Error can be resolved by using the Media Center Decoder Utility (MCDU). If change the audio to be FFDSHOW and then tweak FFDSHOW to play all audio (I haven’t quite worked out what all of the settings are yet), my weird error goes away. Just an FYI, I did update my nVidia HDMI Audio drivers, but that had no effect until I started messing with MCDU. Thanks for the guide. I’m just thinkin to buy a radeon card. My question is sound from tv tuner.. Is it possible to pass the sound of TV tuner through HDMI? Wow its great that some of us can finally bitstream hd audio, however this guide is for very advanced users, I got lost half way thru,:(But I am gratfull Damian has got the ball rolling on this. I was ok with part one. But could not get bitstreaming to work, I have mainly mpeg/mkv with hd audio. But it only comes out standard dolby or dts. I would love like most of us to simply use wmc for everything. Maybe one microsoft will have this work out the box. Unless some one can make an opensource plug in for hd audio and mkv for windows 7 mc? I have wmc7,haali and yammm, my hardware(ati5770)can bitstream,but not had the lamp on my denon yet with a movie file. How do you use the mpc stand alone filters,i extracted them, but are you ment to install them as a driver somewhere like you do for the edid overide? I think you actually highlight part of the problem, it is more involved then it should be. So you haven’t had any luck bitstreaming with MPC? I wouldn’t even bother looking at Part II until you can get MPC working. Did you get a chance to post on AVSForum. Regarding your question about the standalone filters I clearly state you just need to register then by creating a .bat file. That is all that is needed, but let me know if you need clarification. I actually got all this setup prior to your guide (w/help from your other guides & AVS forum) however, perusing here confirms my setup is about identical. All videos play and bitstreaming DTS-MA/TrueHD rocks the house! I’ve standardized on my BD rips using MKV w/untouched HD audio. Now onto tweaking PQ in MPC which shouldn’t require much. A few items I haven’t really seen mentioned or discussed anywhere. 1. Does anyone update MPC-HC as often as some folks update FFDshow? 2. When using the standalone filters should or is it good practice to match the filter “build” version with the same “build” version as MPC-HC? 3. When updating the filters does one need to re-register or just overwrite the previous version? Very nice, concise, easy to understand guide that really works! I would appreciate it if you could please provide your input regarding the below. I only have a few BD’s with TrueHD that I ripped to MKV however, I did try this tonight with Resident Evil (2002) and here’s what I found. 7MC/WMP: FF/FR, AVR displays TrueHD but results in audio loss. No way to restore audio except to stop & restart the movie. 7MC/MPC: FF/FR, AVR displays TrueHD but results in audio stutter which takes a long time to recover, on the order of 30 seconds. Seeking again just amplifies the stutter and recovering is futile. Video itself is fine. Pausing on either player appears ok.
I’m still using RedwoodXT_8.69_RC3_VistaWin7_Dec16.exe driver but with the Realtek 2.42 audio driver. I don’t usually skip through a movie but still this is now yet another major annoyance to resolve. Any clue if this a Denon/EDID, ATI, Realtek, or FFDshow issue? FFDshow build 3278 has a TrueHD fix : audio loss or audio cuts while seeking. 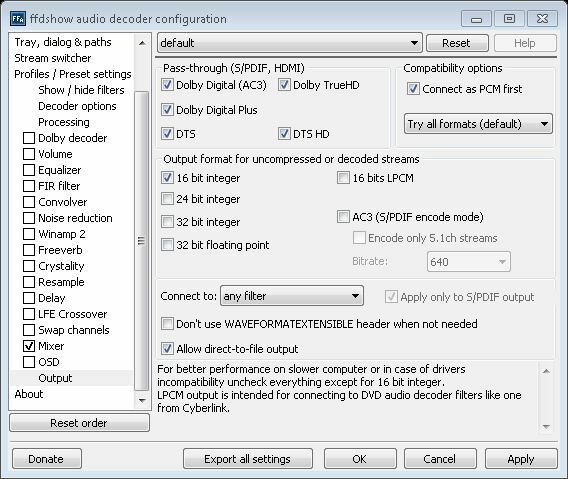 Build 3285 has HD audio bitstream regression fix on 3278. This weekend I’ll try updating FFDshow and see what happens. What about the normalisation that kicks in sometimes in the Denon Amp with TrueHD that I mentioned, have you noticed such issues?? Thanks for answering. Makes good sense to me. Sorry, yes concerning normalization which I have noticed at the start of a movie but only lasts for 2~3 seconds. What is weird is if I stop the movie, I find the AVR still has TrueHD blue LED lit up and if I start playback again then the audio is fine…no normalization occurs. Those of you experiencing lossless audio issues. Please post your hardware setup. I had massive issues with lossless audio with my clarkdale and denon 2310 setup. I updated the firmware on my Denon 2310 and most issues are completely gone now. do you have a link for Denon FW upgrades? Denon only provides FW updates to the general public on their higher end models but not often. One must ship (or hand carry) the AVR to an authorized Denon repair service. Someone who knows far more than me on this subject please read this post. “jdsmoothie” and “batpig” are the Denon guru’s. BTW, prior to all this I was not able to bitstream TrueHD at all. I had to apply an EDID modification which up until recently was thought to be a fault of the ATI 5xxx cards however, this has proven to be a fault in Denon & some Onyko AVR’s. Oddly, the fix could also be done by ATI but don’t hold your breath. I tried FFDshow rev 3287 which did clear up the TrueHD audio stutter for FF/FR but, audio is lost. It worked once but subsequent FF/FR dropped audio completely. As you may remember I could not get my Concert David Gilmour to make work. I traied MKV and TS files and MPC will not play which is no problem . I got it working in TMT3, but I had to uninstall the RealtekHD HDMI and use ATI HDMI out to make it work in TMT3.All I have to do is copy the concert as ISO and mounted in TMT3. The MKV files plays fine. Is there anything I shuld change in the MPC or FFDshow to make it work? Sorry I make mistake. The above post shuld be in part one of your write up. I use your Part one set up. No problem posting here. I think TMT only works with the ATI drivers and not the Realtek HDMI driver, which is why it works for you. As far as I know whether you use Realtek or ATI drivers should not affect a video actually playing back. So your mkvs play fine with HD audio but now your ts files do not? Did you install haali or any other codecs/filters of late? Yes mkv play fine with HD audio dts. Ts files VC-1 truehd do not play video at all and audio is not TrueHD. I did not install any codecs, or halli lately. I may try to install realtek HD again to see fro sure if that is for problem. You are trying to play in MPC, correct, and not WMP/WMC default player? Thanks for the detailed guide. I have tried bistreaming with both the DIY WAY as well as the SHARKS CODEC PACK, but i cannot bitstream DTS-HD and trueHD. I have an ATI 5770 connected to a denon AVR-3808 receiver with 5.1 speakers. When i play an mkv file with dts-HD everything seem to be working fine according to ffdshow (Output: HDMI bistream (1403)) but thre is no sound and the receiver does not receive any audio signal. In the case of the trueHD fille, which is an m2ts file, according to ffdshow the input is 48000 Hz 8-channels trueHD (libavcodec) but the output is 48000 Hz, 8-channels 32 bit integer. I have followed every step of the guide more than once but i always get the same result. I have windows 7 64x with MPC HC 1.3.1249.0, ffdshow tryouts revision 3287 and Catalyst 10.2. I have not installed any other codecs/filters. Is there anything else i can try ? You were right , it works with realtekHDMI or ATI HDMI. It was very strange what happend. I moved the TS file to diffrent location and it start play fine HD Audio and video no problem. For some reason MPC did not want to play that particullar previus location. I had this Ts file for week in that location and played fine and I did not do anything to that file. So I do not know what happend , but I am happy it works all now. TMT3 plays great my Concert TrueHD , and MPC plays MKV and TS with Blue light in the receiver. I shuld leave the PC alone now. Thank you for you help, and sorry for so may question. 2) Did y ou try the EDID Override? I have had bitstreaming working using a friend’s PS3 and i also have the latest firware installed. I think that i am doing something wrong because i have no sound at all with the DTS-HD mkv file even though ffdshow says that bistreaming works. 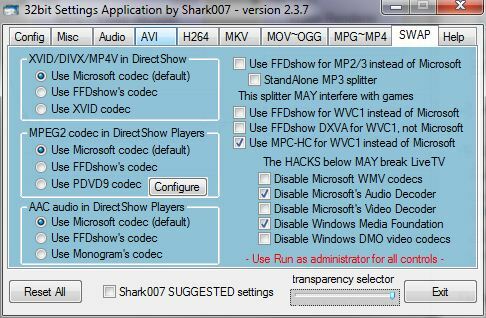 Any chance you can go back to a previous copy of your W7 before you installed Shark or any other codecs/filters, and just try FFDShow + MPC as in Part I? I am just wondering if something got messed up or is conflicting with your system along the way. Also I have installed different codecs including PDVD9. Do you actually see FFDShow displaying DDTrueHD/DTS-HD (bitstreaming)? Have you tried any other MPC-HC Version? I think you are using an older version try the latest tryout of MPC-HC 1705! in the morning I only saw the first photo for TrueHD that is definitely NOT bitstreaming since you are using the libavcodec, now that I have the time to look at your 2nd photo (DTS-HD) this is correct, this is what you should also be seeing with DDTrueHD. One question only in the Control Panel and Sound Option when you select the Realtek or ATI HDMI Output and you go to the advanced options have you set the Default format to 96kHz/16bit studio quality? Regarding MPC I am using the 32bit version of MPC-HC with 32bit FFDShow codecs, but I have also managed to make it work in my previous W7 Install with 64bit MPC and FFDShow. It works in both (32/64) as long as both MPC and FFDShow are aligned! 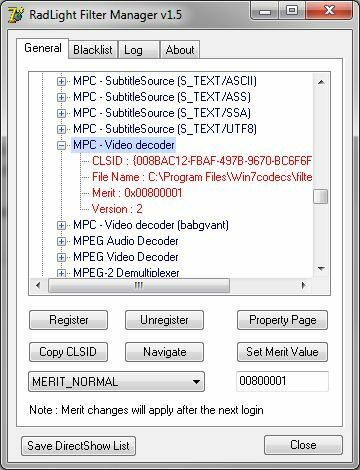 I know that this is guide is supposed to allow us to bitstream via WMC, but have you actually managed to play any type of movie (mkv, m2ts) in WMP12 or WMC7 with the Pass Through (and all Formats checked) option enabled in FFDAudio Encoder. It has been hit or miss for me. Some movies DTS(MA) and TrueHD light up and play right away in WMP12, some don’t. I get the blank screen, uncheck all the audio, recheck, and then it works, once… I had shut off MPC in MediaBrowser for some testing. My dad had come over and wanted to watch Star Trek, so I put it on (an mkv Blu Ray Rip). I forget MPC was shut off but WMC started playing Star Trek with TrueHD without a hitch (I thought, cool!). After about 10 minutes I started getting a few stutters and then lost volume altogether. I then played Star Trek in MPC, played like a champ. Very frustrating, I need to leave a post for the FFDshow developer on doom to see if anyone else is having the same issues. TrueHD audio drop out on seek is more or less confirmed. Finally after installing and uninstalling everything i am now bitstreaming DTS-HD but not trueHD. Is there any chance that this is because the file with the trueHD stream is an m2ts file? Yes i did the EDID override. Actually, when bitstreaming finally worked, at least for DTS-HD, i did exactly the same thinks as i had previously done, with the exception of using the latest versions of MPC HC and ffdshow. Ok, if anyone is interested the winning combination for me to have flawless FR/FF/skip for TrueHD is using FFDshow 3305 & MPC-HC build 1731. Renethx suggestion (above url) helps for WMP but is not consistent. Still get audio loss but toggling FR/FF re-engages the audio. I’ll stick with MPC until the HDMI audio improvements/patches MSFT delivers in SP1…but that’s going to be awhile. I will try today Blackcell’s setup including Renethx suggestion and provide feedback! Is there a way to implement bitstreaming in XBMC??? That would be ideal!!! Just updated to the latest FFDShow and MPC on my clarkdale, bitstreaming works fine as did before. Also, interesting note, I was unable to get bitstreaming to work with my Pio VSX94 AVR. For some reason the HDMI input I was using was not allowing the passthrough, I moved the HTPC to a different input and it works perfect!!! 2. DXVA causes me loads of quality issues, Black becomes grey and all colors and pitctue overall looks inferior. As soon as I disable DXVA everything looks normal. Not sure why! 4. Very strange with WMP12 I have no audio stuttering pretty stable for all 4 formats DD,DTS,DDTrueHD and DTS-HD. As soon as I use WMC to view the same movies I have no problem for DDTrueHD and DTS-HD but ALL DD,DTS movies (mkvs) suffer from awful audio stuttering every 1second, the AMP looses the signal and it is just UN-PLAYABLE!! I do not know what to do, I am pretty fed up with WMC you fix something and then something else goes wrong in either WMC or WMP and I downgraded to W7 32bit to avoid such isses. So the question now is what is going wrong with WMC but NOT WMP and what is possibly wrong with DXVA!! Regarding # 4, did you disable sounds in WMC? I have read doing this fixes some issues which I think may be what you are seeing in #4. Honestly, having to hack around to get WMC to work is causing me too many issues (DVD discs not playing, issues with livetv, etc…). MPC works great 100% of the time for me, so I decided to do a clean reinstall of W7 on my HTPC yesterday, installed MPC + FFDShow, assigned mkv and m2ts to MPC from Mediabrowser. No other codecs, WMC behaves as it should and I get bitstreaming via MPC. Plus I find the PQ much better with MPC. WMC is used for avis/mpegs/mp4, Video_TS and plays perfect without the need for additional codecs. MPC is used for mkv/m2ts which would be the format that I would want bitstreaming for. Yes I have unchecked the Play Navigation sounds in the WMC setup. Thanks for all your help & support! Hi, Thanks for this great guide!! I tried and it worked just beautifully!!! I uninstalled all the codecs I previously installed(Haali, ffdshow, AC3filter). 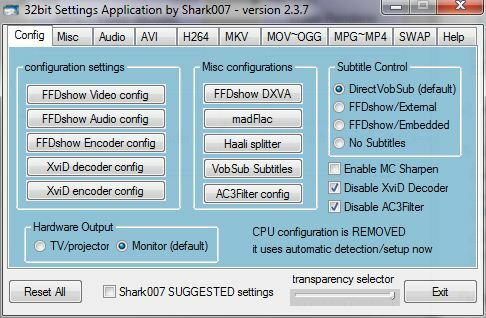 Then I reinstalled ffdshow and shark007 codec pack. 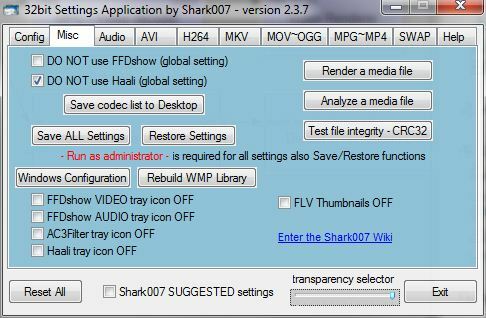 And I followed your settings on ffdshow and shark007 except I used Haali, since I only use mkvs. The result was great! So simple steps without any register tweaks!! The following is my setup. intel i3-530 + H55, Windows 7 professional 32bit and nothing more. gonna do a format before going trough all of this first though. A reinstall is really due, my pc is just getting… sloppy. A reinstall is always a good thing. I would recommend if possible just sticking with MPC + FFDShow as laid out in Part I so you don’t have to mess around with extra codecs/filters. I just seem to get the best/most consistent results with the 5670 HTPCs. I actually just finished building a core i5 mini-ITX HTPC (shoudl have a post up by end of day today) so still messing around with the best approach as MPC has issues with Clarkdale out of the box. Thank you so much for this very concise and informative guide. With it, I had bitstreaming to my Onkyo 707 working quickly after I upgraded to Windows 7 (32-bit) and a new 5670. I was wondering if you ever encountered an issue that I have been having with certain avi and mkv files, because your setup is so similar to mine. When I start these video files in MPC or WMC it disables my audio. I have to turn my receiver on and off to re-enable it. As I said, it is only with certain avi and mkv files, not all. All of them are tv episodes, not movies. The strange part is that graphstudio handles the files the same way as working video files. The problem is occurring using both the DIY method and Shark007′s Codec Pack. My only solution right now is disabling pass-through for the offending files in order to watch and hear them. and not using arcsoft audio renderder ? Actualy the only thing working is MPC 32 with arsoft audio renderer. That is very strange. Right now I am using MPC for my mkvs and ts movies, and for all others (mp4, mpeg, avi) I use the default WMP player. Haven’t run into any issues with audio dropping. Since I use MPC for my Blu Ray rips (mkv and ts) I only need to install FFDShow and not mess around with any o ther codecs/filters, so this seems to be the reliable solution. Cant get it to work on Win7 x64 with onboard HD3200, using pass thru to Xonar 1.3 Slim. Trying Shark007 and MPC-HC. Setting everything above, when i open the mkv file and select the DTS:HD track I get no sound, and on my amp i can see it flicker extremely quickly on just a DTS track. But if i flip it to the second audio track which is standard DTS it works fine. Am i right in saying that with the Xonar the only way to get DTS:HD pass-thru is to use the Arcsoft Audio Renderer? (something i read somewhere). If you get an answer definitely report back. Has this method matured any in the last few months? I’m currently, successfully, using your MPC-HC/MC7/MediaBrowser method, but would love to “just” use MC7/MB. Other than ease of setup, what are the benefits of using MPC-HC over the built-in MC7 player? Does MC7 support chapters and subtitles in MKV containers? I honestly haven’t revisited the MC7 method, as I just ran into too many problems with hacking up Media Foundation. To be honest though I haven’t tried in a while so maybe things have gotten a lot more stable. If I have some time I may test out again. I agree it would be nice to just use the internal WMC player, but why I like MPC is I don’t have to mess around with any of these issues, it is a simple Install FFDShow, Install MPC HC, and nothing else!!! I’m running a 5670 catalyst 10.4 with windows 7. I followed the guide and went through it twice, for the life of my I cannot get DTS-HD to bitstream. The receiver (Onkyo SR-705) only lights up indicating DTS. Any suggestions? I’m using the shark codec pack BTW. Have you ever gotten DTS(MA) to work? If not can you try using just MPC HC (I like to use this as confirmation that all my connections/settings are correct). I tried a new version of MPC-HC and success finally!! Thanks for the help Damian. I will test TrueHD next. I finally put my Core i3 together and I tried your part 1 tutorial and it worked as you said. I really want to use XBMC instead, I have read your part 2 but before I get started, will the new Dharma version of XBMC work without doing all of this? After I put in the Intel chipset driver, my Denon receiver shows multichannel 7.1 in and out when I switch to the PC that I will be running XMBC on. So should I be patient or will part 2 still be required with Dharma? Did you write an article on using XBMC DSPlayer? Thanks (yet again) for your help!! I recently discovered your site, and I want to say thanks for all of your work. It has been very helpful for setting up my HTPC. I wanted to leave my configuration and comments about bitstreaming the HD audio. Played around with the Shark codec pack, but felt like this way was less intrusive. Again, thanks for the info. I’m running windows 7 – Following instructions on part II. It does not let me register the MatroskaSplitter.ax or the MpegSplitter.ax. When I click the bat file it says they loaded but the Dillregisterserver failed. When I run windows 7 Tweaker I do not have the MCH filter as a choice. Stuck at this point. i can see a/v all bitstream movies accept dolby digital plus. any suggest what to do? 1) In ffdshow, under Output, I had to uncheck “Connect at PCM first”. 2) If I set my audio configuration to 5.1 or 7.1 in Playback Devices/ATI HDMI Output, then live TV recordings would give a playback error. The fix was to disable sounds when navigating WMC. What is the difference between bitstream vs PCM? I bought a new HTiB this past week and I need to know this. Bitstream you are sending the unaltered audio track to the Receiver to decode. Basically think about it that DTS(MA) and TrueHD are compressed audio tracks (like a zip file) and when you bitstream to a receiver you are relying on your receiver to decode (“unzip”). PCM would be the uncompressed audio track (so after DTSMA and TrueHD have been decoded). In this case you are relying on the media player to handle decoding first and then sending as PCM to the receiver.